Torosaurus, pronounced TOR-uh-SAWR-us, (protuberance lizard) was an immense chasmosaurine ceratopsid (tribe Triceratopsini) dinosaur, having had one of the largest skulls of any known land animal, measuring in at a staggering nine-feet long. Chasmosaurinae is a subfamily of Ceratopsid dinosaurs—Torosaurus and Triceratops are two well-known relatives of the family Chasmosaurinae. Being of a ‘tribe’ (Triceratopsini) of genera, the genus is considered to be at the pinnacle of development for that family. Torosaurus (and its better-known cousin Triceratops) is one of the most advanced herbivores of its time. What did Torosaurus Look Like? Torosaurus had a jarringly large skull with bony crest that could measure nine feet long, with the massive crest itself taking up more than half the total length. The head itself was large and supported long, sharp, and robust horns on the brow just above the eyes. 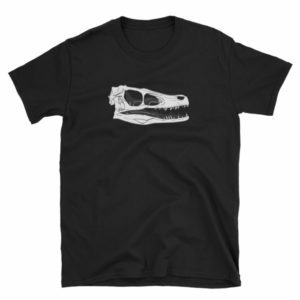 The skull of Torosaurus is the largest of any land animal that ever lived. In comparison the body was also large, but softer and without the defenses of any hard bony scales. 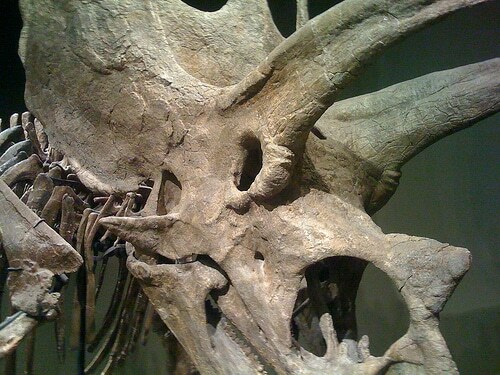 The neck frill and horns of Torosaurus would have had to suffice in most of this animal’s defense. It is probable also that the frill was decorated in such a way as to serve methods of defense, as well as to attract potential mates. Chasmosaurinae all share the basic characteristics of the prominent brow horns and long neck frills with no other spines or scales. Torosaurus was an herbivore, belonging to one of the most successful groups of herbivores of their time. The species genus was primarily quadrupedal and heavy; as such, this genus would have had to eat a lot of food to maintain its heft. Torosaurus probably browsed daily on area foliage, and probably in the swampiest areas, venturing out miles to graze upon any grassy areas, which would have still been sparse at the time. Torosaurus probably ate ferns, conifers and cycads, utilizing its strong jaws and sharp beak to break heavier pieces of foliage. Torosaurus was a quadrupedal herbivore which however belongs to the family whose name indicates a tendency to move in bipedal movement at times. A member of the micro-order Neoceratopsia, and the tribe Triceratopsini, Torosaurus could have been advanced enough to have exhibited or been a precursor for bipedal movement. 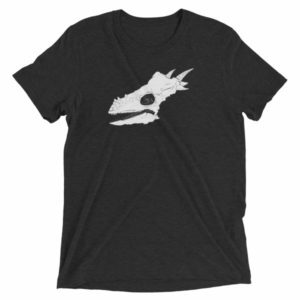 Only minimal Torosaurus fossil-finds have been made, so knowledge is sparse. After previously being considered slow, with inefficiently opposing—or splaying—forelimbs, new findings based on unscarred and uncrushed fossils showed that the forelimbs of Torosaurus were articulated in such an aligned way that enable it to run incredibly fast, much like today’s rhino. Against a carnivorous predator, the speed of a Torosaurid dinosaur gait could have been added defense. 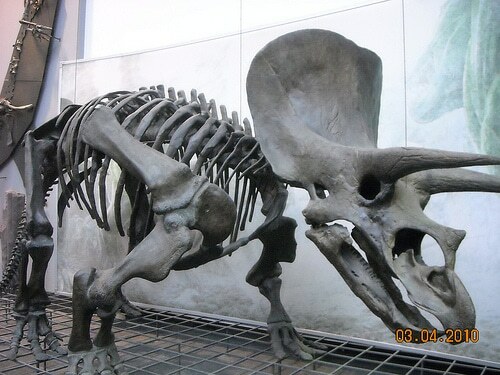 This would be a major positive, considering that there is no evidence to show any other protective mechanism than the brow horns and neck frill (shield) of Torosaurus. Fossils have been found in the USA and in Canada, on the North American continent. Torosaurus lived during the Late Cretaceous Period and probably enjoyed being one of the most successful manifestations of herbivorous dinosaur species to have existed. Fossilized remains of Torosaurus have been found in the US states of Wyoming, Montana, Colorado, South Dakota, New Mexico, Texas, and Utah. Torosaurus fossils have been found in Montana, South Dakota, Texas, New Mexico, Utah and Canada. There are several Torosaurus finds which span the North American continent; however, few solid indications remain of this species. In comparison with some dinosaurs, not many Torosaurid fossils are found. 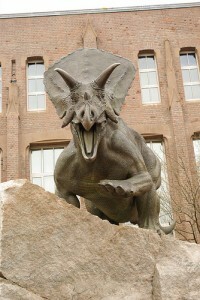 Its cousin Triceratops has been much more abundant in findings. The first (1891), Torosaurus latus was named by paleontologist Othniel Charles Marsh—found in Wyoming by John Bell Hatcher. T. latus findings consisted of a pair of skulls with the elongated frills present. Since then, similar specimens have been found in other North American continental areas. There are a myriad of variations among the physical qualities of recovered specimens, resulting in an unsure account to date of many solid characteristics for Torosaurus, other than the head and some other minimal stray parts. Torosaurus is named for its subsequent ceratopsian finding as a “New Ceratopsian”, or “New Horned Face”. Newer information regarding the gait and movement of Torosaurus leads to the theory that this genus could have been much more like today’s modern hippopotamus than as previously believed to be somewhat more prone, like the elephant. Like the hippo, Torosaurus probably seemed more prone than it actually was. When the massive, possibly decorated, shield and brown horns of Torosaurus didn’t dissuade its aggressors then it is likely that Torosaurus sometimes make a quick get-a-way, either on foot or underwater. Since we know that the modern hippo can run up to eight miles per hour while submerged beneath the water’s surface, we can imagine that this similar animal could practice the same sort of subversive defense. Since Torosaurus existed before the bulk of the grasses sprang up in abundance, it is likely that the species spent most of its time in or near swampy areas that were in close proximity to deeper areas of swamp and of ponds or lakes. This behavior would have help Torosaurus to maintain a lower profile, especially considering their size. Torosaurus is another species of dinosaur family that became extinct after the Cretaceous–Paleogene (or K–Pg) extinction event. It is estimated that approximately 17% of families, 50% of genera and 75% of species became extinct after this event. This also included the majority of non-avian dinosaurs. Mammals and birds emerged as dominant land vertebrates in the age of new and abundant animal life. Today, scientists hope to uncover more information about the specific fate of Torosaurus in relation to the events prehistoric times. 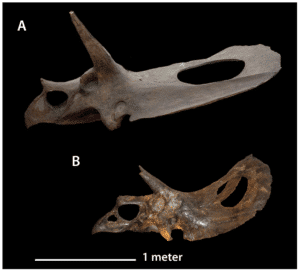 The 3rd picture above is the skeleton of a Triceratops, not Torosaurus.